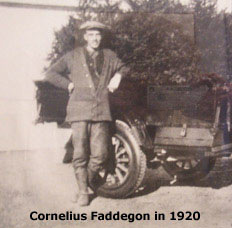 About Faddegon's Nursery, Inc. | Faddegon's Nursery, Inc.
…Cornelius Johanas Faddegon, was a graftsman and grower of tulip bulbs. He came to the United States intending to stay for a brief visit to sell his tulips. Instead, Cornelius found himself stranded here as shipping lanes closed because of the German u boats. Cornelia, his fiance, was left behind in Holland waiting for the day she might join him. Seven years later, when travel by sea was still extremely dangerous, Cornelius’s fiance managed to find a spot on a passenger ship carrying mostly Irish immigrants. …2 days after the death of her mother, but arrived safely. Since it would have been scandalous for them to be together unescorted, the couple was married immediately on the ship by the captain. They traveled to Albany where there was a large Dutch community and founded Faddegon’s Nursery 92 years ago. Still owned and operated by the Faddegon family, the business has grown significantly with each decade of its existence. It continues to define nursery excellence in the capital region. …sharing the passion for all things horticultural. With ever “growing” expertise, we can guide our customers through a complete home landscaping project or help to prepare a vegetable garden! Our sales staff and foremen have 373 years of collective service at Faddegons. We are proud to say that those 373 years of experience allows us to provide gardening knowledge, guidance and inspiration that is unmatched anywhere! Each year we research and collect new and interesting cultivars of perennials, annuals and nursery stock expanding the possibilities for a breathtaking garden and allowing more creative combinations than ever before. The capital district has grown up around us and would be largely unrecognizable to Cornelius. Faddegon’s Nursery remains in the same location with the same mission. To strive to serve our customers to the very best of our ability so that we might continue on for yet another century. John Faddegon, Cornelius’s son, often said, “Have a blast.” That is just what we continue to do as we carry on the tradition of excellence. We wish the same for our customers. Have a blast! There is no better place for a family to come together than in the peace of a garden. So if you can imagine it, Faddegon’s can design it into the life of your home.